UNPOL patrol in the Menaka region in the far north-east of Mali. The state of human rights and security across Mali is a "cause of grave concern," the independent UN rights expert for the northwest African nation said in a statement on Tuesday, in which he called for an "effective military response" to end the violence and protect the civilian population. Alioune Tine noted that central and northern areas, where conditions are continuing to worsen, and the Government presence is weak, are being particularly hard hit. That, combined with growing extremist violence, combined with counter-terrorism operations by Malian and international forces - as well as organized crime - are creating a "deep sense of fear and insecurity." Areas that were untroubled just months ago, are now affected by violence, the expert added, including "serious and recurrent violations and abuses of human rights, including allegations of extrajudicial executions, abductions, torture, ill-treatment and illegal detention." 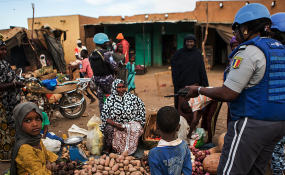 The UN expert said that a comprehensive and coordinated strategy involving the various Governmental forces seeking to wrest control of all parts of Mali from armed groups, is needed to prevent human rights abuses. He said acknowledgement was needed that in the absence of concrete development initiatives and solutions to the "rampant" poverty in the northern and central regions, it will be difficult to eradicate violence. Mr. Tine urged the Malian Government to "take the bull by the horns," and "eradicate the cancer of impunity". He noted the start of investigations into the alleged involvement of Malian soldiers in reports of human rights violations and abuses. And called for the responsibility of all those involved in serious human rights violations to be established in courts following fair trials.